To make simple syrup combine honey, water, rosemary sprigs, and cinnamon sticks over medium heat in a small saucepan. Bring to a simmer, stirring frequently until honey has dissolved into water. Remove from heat and allow to cool completely. Once cool, remove rosemary and cinnamon sticks and transfer to an airtight container. To make cocktail, add 4 teaspoons of the cinnamon rosemary simple syrup and 3 dashes of bitters to an Old Fashioned glass. Swirl syrup and bitters around in glass. Add bourbon, ice, orange peel, and stir. Store extra simple syrup in airtight container in refrigerator. 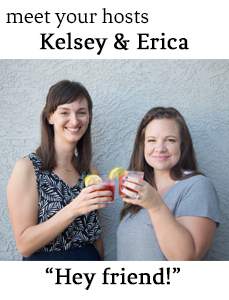 In 2016 Erica focused on the word PEACE and Kelsey focused on THE YEAR OF KELSEY. And she's written a little bit about her capsule skin care and makeup routine on her blog. Erica has a great interview on The Mom Hour about her adoption story. Her girls are officially adopted and she couldn't be happier! Kelsey hired a sleep coach and all the Whartons are getting more sleep.